If you don’t like the idea of completely removing your old concrete to introduce a new and fresh design, the good news is that you might not have to. Many concrete paths, driveways and floors can be resurfaced, saving you a great deal of time and money. Concrete resurfacing is a great way to revitalise old looking concrete and make it fresh again. It’s also a practical and economical way to increase the livability of your home and improve its value. Essentially, concrete resurfacing is adding a decorative layer to your concrete. It is generally performed using polymer-modified overlay systems or cement-based overlays. Polymer-modified overlays blend polymer resins with cement, sand and other additives, increasing its performance, wear resistance and overall look. The process and products required will slightly vary based on the type of surface. For example, Overcrete resurfacing compound is only used as a decorative coating and is applied in thin coats, while there are other products such as floor levelers that can be applied up to 30 millimeters thick in one application. If the surface requires filling in a pre-existing pattern or holes greater than 3mm than the use of floor leveler would be more beneficial prior to coating with the Overcrete resurfacing compound. Concrete resurfacing is available in a wide range of colours, designs and textures, meaning if you fancy a change, you are free to do so. 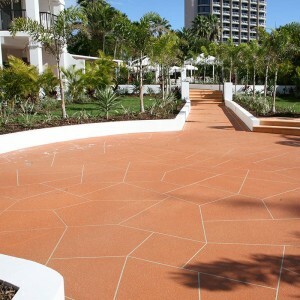 Options include sandstone, granite, brick and paved finishes. 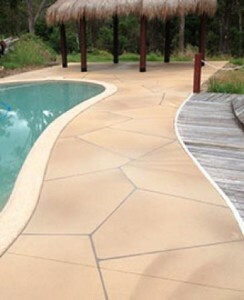 You could also use colour to create warmth or an aged look and can create a stamped concrete look. Pre-existing coatings should be ground off prior to resurfacing the concrete, as the coatings compatibility could affect the adhesion. While small cracks can be covered during resurfacing, larger cracks will need to be repaired before any resurfacing is done. An epoxy and silica sand mix is usually used for repairing small to medium cracks. Whilst repairing cracks there are no guarantees. If the concrete moves and re-cracks then so will your concrete resurfacing. If any structural damage has been done to your concrete, such as underlying soil movement, resurfacing will not solve the problem. Importantly, always make sure you have a sound foundation for your concrete resurfacing work. As many who have tried to resurface on their own have learned, if the base concrete is dusty, flaky, weak and/or chalky, the coatings might simply lift off. If this is the case, additional preparation needs to be taken to grind the cement laitance off the top so you have a solid foundation to work with. What are the costs associated with resurfacing? The overall cost of your resurfacing will certainly depend on whether you choose to tackle the job yourself. If you choose to do so, make sure you know what you’re doing as you can quickly lose all your savings and more if the resurfacing doesn’t hold. Other factors affecting the cost include how large a space you are resurfacing and which resurfacing product you choose. Additionally, the price will depend on the level of detail required . If you require a border colour that’s different from the main body colour, it will cost more. Alternatively, if it’s a blanket spray across the entire surface, it’s going to be less expensive. Finally, if the job requires additional leveling prior to applying the concrete resurfacing compound, it will cost more; whereas smooth and well finished concrete surfaces are more cost effective to work with. Essentially, resurfacing is a very affordable way to bring life to your concrete whether you do it yourself or have the work carried out quickly and efficiently by a professional.